If you are as addicted to televised sporting events as I am, then you will have noticed a striking proliferation of political messaging in the guise of commercial TV ads. In a spectacle of shameless partisanship, companies like the Keg restaurant chain, Smirnoff, Tim Horton's and a myriad of others are carrying the ball for the government open borders agenda. We are a diverse nation of immigrants and must remain so. Diversity is our strength, and to maintain it we must be 'welcoming' and 'open' to those who aspire to join us. We must be "inclusive" in order to tap into the many talents that newcomers and the marginalized offer us. We must embrace differences and celebrate them. We are different, but we are all the same. One big happy human family. So let's keep our front door unlocked and wide open. End of sermon. Do me a favour. Take 20 minutes and sample the Youtube videos linked here to gain a flavour of what I am talking about. But swallow a Gravol tablet first. Aside from a uniform message, there are other similarities. One is their limited repertoire of clichés, which appear to be recycled from one ad to another. Try this experiment. Watch a batch of them in succession, then close your eyes and try to recall a set of barf bag buzzwords that are exclusive to one of them. Good luck. As your memory fades, these eight Youtube vids fuse into one, like so many day time soap operas. They may sell different beverages, but it's all the same Kool Aid. Let's run through them. Canada is not my home, it is everyone's home. There is space here for everyone. Canadians embrace diversity, embrace differences and celebrate them. It is not only feeling safe but being safe. The Youtube clip began with a newscaster on a TV screen above the bar saying "Canada will welcome more immigrants next year than ever before." Nice touch. It was all part of Smirnoff Canada's "Stay Open" campaign, which the company introduced in October by stating that "Smirnoff believes that inclusivity is always worth celebrating. And right now, Canada stands as a shining example of openness in a world that is increasingly feeling the opposite. So we raised a glass with real Canadian immigrants and citizens who shared why they're proud to call Canada home." The Canadian Football league launched a campaign in August on the heels of the Charlottesville incident to make the same point, the point that ours is an exceptional country, that Canada and what it represents is the antithesis of the bigotry and racism we see south of the border. 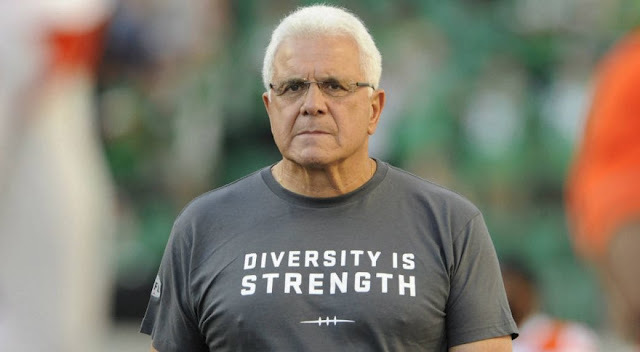 Viewers are told that the CFL is "a league as diverse as the country, a league which makes each of us different makes all of us strong." What is apparent after viewing one of these impactful commercials is that the admen have mastered the art of story- telling. Consummate marketers are great story-tellers. They build narratives around products — or brands — that we can quickly grasp at a simple emotional level. Tim Horton's "Proud Fathers" is a masterpiece in that regard. The ad features a Chinese father and son at a hockey rink where the father came to see his grandson play hockey. "Grandad" told his adult son that his grandson plays hockey better than his father did. "How would you know," the son asked. "I watched you play," replied "Grandad." "Oh, then what team did I play for?" The question prompted the old man to pull a picture of his son's team with his son featured on it. Seeing this, the son became emotional, and no doubt viewers did too. It really pulls heartstrings. The message was about continuity. Not only the continuity between generations, but the continuity of Canadian tradition and culture as represented by our love of this game, which despite the upheavals of mass third world immigration, endures. The hope and expectation is that old stock Canadians will watch this commercial and conclude, "See, these people are just like you and me. They play and appreciate our national sport of hockey. And they like the brand of coffee made by Tim Horton's, which as we know is Canadians' favourite coffee. Part of our Canadian identity." Other Tim Horton's ads of this calibre are easily recalled. Remember their "Welcome Home" commercial aired during the 2010 Winter Olympics? It depicts the tearful and joyous reunion between a black South African immigrant with his just arrived wife and kids at the airport. We follow the man, speaking in a mixture of Xhosa and heavily accented English, from his apartment to the store to the airport, where he embraces his family and covers their traditional clothing up in good old Canadian winter garb. And in clinching gesture, we see him hand his wife a cup of Tim Horton's. If you didn't have tears running down your cheeks by then you were not a real Canadian. And if you didn't get the message then you don't accept Canadian "values," the values of family and multiculturalism, which go together like a horse and carriage. New Canadians are Canadians. They are as Canadian as maple syrup. As Canadian as Tim Horton's. Is the picture getting clearer for you? Now that you are softened up, let's see how it is done in the United States. Try this one minute pro-immigration ad on behalf of Budweiser aired during the Super Bowl game, entitled "Born the Hard Way." It tells the story of a young German brewer's challenging journey from Europe to the United States, where he was met with disapproval stares and "go back home" taunts, only to land in St.Louis and establish a famous and highly profitable business. The ad was released in the wake of Trump's "Muslim" travel ban and designed to serve as a reminder that America was built by hard working men of ambition like Adophus Busch, and that bigotry then as now is an impediment to the country's national success. But if you thought these last three ads were tear-jerkers, then grab a Kleenex box before you see this one, also broadcast during the Super Bowl. It is called "The Entire Journey" (5:44 minutes). It is about a poor Central American mother who takes to the road with her young daughter to make a long arduous trek to the Promised Land in search of work, only to come face to face with a massive and imposing Trumpian wall that looks as if it is constructed with lumber. Viewers can feel their devastation. My breaking point came when the little girl pulled out a small shredded American flag from her backpack. Oh, God! But then miracle of miracles, they see a door, and they open it. Voila! They're in the Land of the Free and the Home of the Undocumented! But they must keep walking. Alas, along comes a good hearted American guy in a pickup truck to take them on board. The ad concludes with a bumper sticker slogan. "The Will To Succeed is Always Welcome Here." The fact that the ad was sponsored by a construction supply company "84 Lumber" at the cost of $10 million per minute was not lost on many viewers. The home construction industry relies heavily upon cheap illegal immigrant labour. I note the obvious differences between each sort and type, but we are more alike my friends, than we are unalike. We are more alike, my friends, than we are unalike. We are more alike my friends, than unalike. Got it? So if you are stabbed by a Somali in Minneapolis, remember, people are people, more alike than unalike. The name of the game for pitch men is to trigger our emotions, and by doing so, override our logical reasoning. Scam artists do much the same thing. Once they are able to push your emotional buttons, they're in. Tell them that their granddaughter languishes in a Guatemalan jail and they'll send off a $2000 Moneygram to a phony lawyer no questions asked. Show them the corpse of a four year old Alan Kurdi washed up on a Turkish beach, and it is open sesame for 900,000 Syrian migrants. We are cursed with empathy which, we're told, we can never have too much of. Knee-jerk empathy unconstrained by a modicum of healthy skepticism. When we watch a grandfather and his son talking to each other in a hockey arena about fond memories, or see an immigrant re-uniting with his family at Pearson International or witness the tribulations of a migrant mother and daughter struggling to find a new life, we establish a connection. Once that connection is established our emotions are in the hands of the storyteller. It is like a Lassie Come Home movie. We identify with the dog, care about the outcome, and the suspense builds until the climax. Tears of sorrow become tears of joy. An advertisement that in just one minute can tell a story, make us identify with the characters, build suspense and then deliver a moving punch line is a advertisement worth paying for. It is the kind of ad that is remembered. They want you to remember the message, but most importantly, they want you to remember the brand. Canadian hospitality — brought to you by The Keg. Canadian family values — brought to you by Tim Horton's. Openness and inclusion — brought to you by Smirnoff's. The goal of the corporate-government consortium is total control and guaranteed profit, and the imposition of ideological conformity marching under the banner of diversity. The language they speak, "diversity babble," is now the lingua franca of the political class that presides over the Great Replacement in Europe and North America. It is a jargon that serves to obfuscate and confuse rather than clarify and enlighten. A smokescreen for the demolition of national sovereignty. The Canada that they want us to feel patriotic about is not the Canada of our fathers or grandfathers. 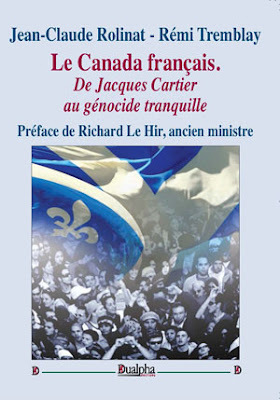 It is not a bicultural nation of two founding peoples but a microcosm of the United Nations where French and Anglo-Celtic Canadians are mere fragments of a "mosaic." The Canada we presently see at YVR or YYZ airports will soon be identical to the Canada we see in every city, town and hamlet across the country. We are no longer a nation, but a geographical entity, a destination stop where everyone is welcome, and everyone instantaneously "Canadian." Drink a cup of Tim Horton's and voila, you are one of us. Play for the BC Lions or the Toronto Raptors and you have the keys to the city. These ads are surely destined to take their place in the Propaganda Hall of Fame alongside the works of Sergei Einsenstein, Leni Refenstahl and Canada's own John Grierson. Just imagine. Social engineering in the service of profits. Bernays and Goebbels would be impressed.